Where to buy: Visage, Four Seasons, Great Wolf Lodge, or online. You can also visit the emerginC website for a full list of where to buy this great product. What they promise: A fast and easy, ready-to-use application which will improve skin tone and texture, brightness and complexion, whiling soothing and nourishing your skin. 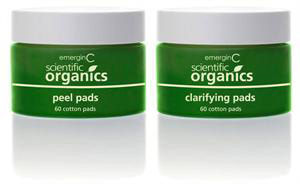 With a very easy 2-step process, emerginC’s clarifying pads have proven to be an effective system to improve the entire look and feel of your skin. Although it does have a very strong smell, you feel as if you are giving your skin a break from harsh face washes that are perfumed. This product is 100% natural and contains a variety of antioxidant rich plant and marine extracts, as well as vitamins. After using this product you feel completely refreshed and replenished. It is a product that helps with just about anything, at any age: pores, blemishes, fine lines and wrinkles. EmerginC doesn’t stop the giving at just a beautiful face; for every retail-size product sold, the company will plant a tree for their commitment to the environment. It is also a fragrance- and colour-free product with no animal ingredients or animal testing, sold in recyclable jars.